I bought a set of sports seats from ebay. installed yesterday and sods law the recliner doesn't work on the driver side. Its just about ok but could do with recliner working to make the seat workable for me. 1) can you swop the recliner motor from a comfort seat to a sport seat? 2) is it relatively easy to take the motor out from the comfort and put it in the sport seat? i've seen some guides to disassemble the seats but can't see anything that shows the motor replacement. 3) any ideas whether this is a common issue, is it likely to be the switch or the motor? 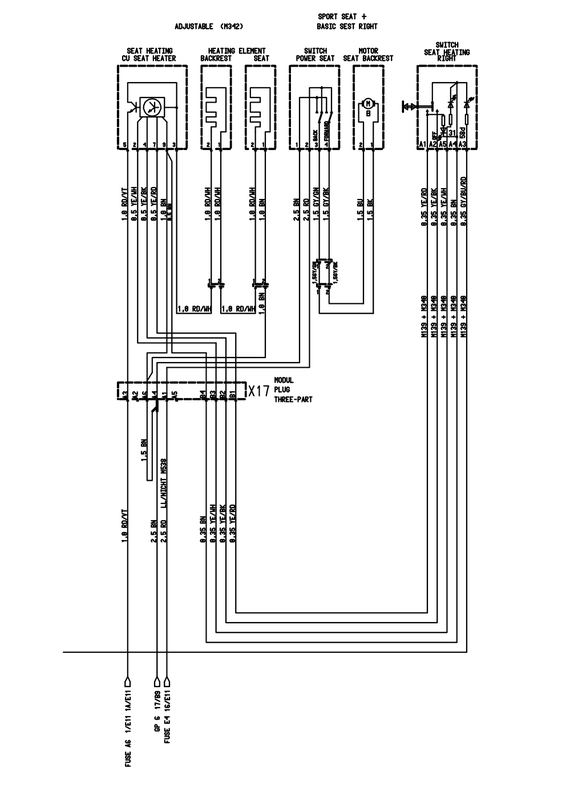 Im afraid there is a limited amount of advise i can give here ..
you need to test the motor to see if its dead or not so i think i have the correct diagram below ..
i would disconnect the harness and with something like a power probe power the seat motor direct to see if it works or not . Things like motors tend to be buryed in the seats .. i have no instructions on replaceing them im afraid but like all things .. remove a bit at a time and take pictures . You may after all only have a problem with the switch as per the diagram . Stupid thing i didnt think of last night .. check the fuse E4 .. There is only a feed an an earth going to the switch so its pretty simple to check .. feed earth coming in and going out after the switch (12 volys on a meter ) .. if you have that then its the motor .. but to be honest .. its a new one on me .. as seat motors almost never fail . thanks deMort. i was struggling with time earlier in the week due to work pressures so didn't have time to start disassembling and testing, i did compare plugs and sockets on old seats and pics of the new seats plugs and sockets and noticed a difference and determined (guessed) that there wasn't power going to the seat. clear difference in the pins inside the socket on the comfort seat and the sports seats. bad news, a plume of white smoke under hard acceleration on the way to hartech though. hoping its aos and hoping they can squeeze in the fix today for me. they can't reproduce and was subject to a gold service including boroscope 6 weeks ago so hoping aos rather than rebuild.